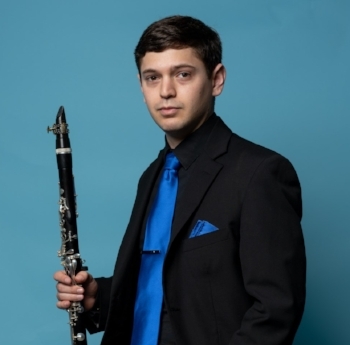 Micah Candiotti-Pacheco is a clarinetist with The Orchestra Now (TŌN), a group of vibrant young musicians from across the globe who are making orchestral music relevant to 21st-century audiences. The members of TŌN are selected from the world’s leading conservatories. The orchestra is in residence at Bard College and performs regularly on campus and at the finest venues in New York, including Carnegie Hall, Lincoln Center, The Metropolitan Museum of Art, and others across the city and beyond. Micah has played the clarinet since he was 10, received his degree from the University of Michigan, and has appeared at music festivals around the country. At a recent concert, Micah was among the orchestra members giving an on-stage introduction and demonstration of a piece (in his case, the Hamlet Overture by Joseph Joachim) and, along with other TŌN players, mingled with the audience during intermission. Both friendly and articulate, Micah was kind enough to talk with me about his approach to learning music. Brent: How do you engage with the music so that it becomes a part of you? Micah: When I’m preparing and practicing music, whether it be for an orchestra concert or solo recital, a big part of my preparation beyond the physical preparation of the music is listening. Brent: How do you find your preferred recording of a piece? Micah: These days it is extremely easy to find recordings of music I’m playing. Listening and studying music that I’m going to perform helps me find my interpretation of the music. It also helps me internalize the music. Brent: What do you do while you listen? Micah: When I’m listening to the piece, I will follow along with my sheet music and make notes of things I’d like to try. Then, in my practice, I’ll see if those things actually work. One way I do this is by recording myself and listening back. This will also help me figure out what’s working and what isn’t technique-wise but also interpretation-wise. Brent: Actors tell me that they do the same thing with an app called Rehearsal. It helps them learn their lines and make sure they are in sync with their character. My next question for you is about the most challenging piece of music you've ever had to memorize and why. How did you conquer it? Micah: When I was in my undergrad at the University of Michigan, I prepared and memorized a clarinet concerto by Lowell Liebermann for the school’s concerto competition. Even though I think I memorize music easier than other musicians, this piece was extremely challenging to memorize. It was 30 minutes in length and very technically challenging. Brent: Was it the notes, the rhythms, or the structure that made it difficult? Micah: Even with the length and technical difficulty, the most difficult aspect of this piece to memorize was the rests. Brent: Interesting! Say more about that. Micah: I needed to internalize the piano part during my rests so that I could come in at the right time. Usually I can study this by listening to the piece, but in this unusual circumstance, the piece was so new I couldn’t find a recording anywhere. Brent: That does sound challenging! Micah: Rehearsing this piece with piano was the first time I really understood how this piece was supposed to sound. In this case, my technique for memorizing was to practice and practice and practice. Eventually I was able to play small chunks of the piece by memory. Then I began piecing those small chunks into larger chunks eventually being able to play full pages from memory. Brent: Right, it always makes sense to break down a score or a script into manageable chunks to get your head around it better. Micah: When I rehearsed with piano I had the music available in front of me, but I would attempt to play entirely from memory. Again, the hardest thing to remember were the rests and when to come in after them. Unfortunately, it was this exactly mistake that would knock me out of the concerto competition. Brent: Ugh! Sorry to hear that. Did you ever get the chance to revisit the piece? Micah: I was able to compete with this piece again in 2016 with The Orchestra Now. Although I didn’t win, I made no memory mistakes and was very happy with how I prepared it. Brent: That sounds very satisfying. Sometimes perseverance and repetition are your best friends. On another subject, I’ve been talking lately with musicians, such as the women of Seraph Brass, about the advantages and drawbacks of performing a piece live without a music stand in front of you. What do you think? Micah: Some consider having a music stand in front of you while you perform as a barrier between you and the audience. Thus, being able to perform from memory might make the performer more engaged with the audience and/or other performers on stage. Brent: That is definitely a benefit. What do you see as the drawbacks? Micah: However, playing from memory can be very stressful, especially if the performer isn’t entirely comfortable with their memorization. This stress can distract the performer from the music and potentially create a lackluster performance. Beyond that, musicians are more likely to make mental mistakes when performing from memory. Brent: A musical theater writer I spoke with, Ben Bonnema, paraphrased Laurence Olivier with regard to why actors forget their lines. One, they don’t know the lines properly. Two, they are not concentrating. Would you make the same argument about musicians? Micah: In my opinion, we as performers can be engaged with the audience and other musicians on stage while having music in front of us. Unfortunately, we tend to use sheet music as a crutch when playing, so if we can get our heads out of the music and simply use the music as reference, we can have engaging performances while keeping our stress levels down and mistakes to a minimum. Brent: If you’re part of a large ensemble, music stands are the norm. If you’re the soloist playing, say, Mozart’s clarinet concerto with the orchestra behind you, it may be more impressive to play without having the stand as a barrier between you and the audience. And the truth is that you’d know the piece so well that you’d rarely glance at the music. You could even keep the stand off to the side. Micah: Memorization is an important skill to learn, but I believe being comfortable on stage is much more important than memorizing. Brent: Absolutely! As with any performance, a musical or theater piece should never sound memorized, mechanical, or robotic. I’m curious about learning strategies, which is why I put so much emphasis on memorization in this blog. Micah: Every audience member listening to you wants to hear a compelling and musical performance. If you think that having sheet music on stage will help you with that—and memorization isn’t required for the performance—then don’t let anybody stop you from using sheet music. Give yourself the best opportunity for success. Brent: It can be reassuring to have that flexibility. Actors don’t have that option! Thanks so much for your time, Micah! I wish you continued success. Micah: Thank you for your interest and for coming to the concert!